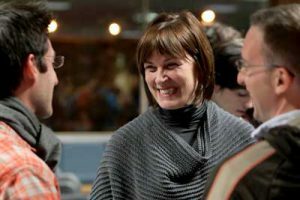 In one of the most spirited Town Halls in recent memory, Principal Heather Munroe-Blum fielded some two dozen questions Tuesday night on a variety of hot-button issues including the Architecture Café, bikes on lower campus, study space and tuition increases. An estimated 100 people squeezed into the common room of Molson Hall residence for the 90-minute Q&A session with the Principal. Organizers scheduled the event later than usual in order to attract more students and their efforts paid off, with all but one question coming from a highly engaged student body. Not surprisingly, the contentious issue of the closing of the Architecture Café was raised almost immediately, with Munroe-Blum being asked about “the secretive way in which the… issue was dealt with” and the lack of consultation during the process. While noting that some people felt excluded from the process, the Principal said the administration has decided to have a working group that will deal with matters of consultation. “How will we approach issues that affect students, but also others in the University community, in a way… that reflects the fact that many of the decisions that are taken in the University develop on a multi-year basis and the implementation of those decisions also happens on a multi-year basis?” she said. “Given the fact that student leadership changes every year, those who are involved are often not here when they are implemented and those who receive the outcome of those decisions often feel like they just happened without them being consulted,” she continued. The Principal said that gap is being bridged on a variety of fronts including by establishing relationships in industry and through philanthropy, noting that the majority of resources being raised through Campaign McGill will support financial aid for undergraduates and fellowship support for graduate students. “Don’t think for a moment there isn’t a concerted effort,” said Munroe-Blum. But this support is increasingly difficult to come by, with the Munroe-Blum citing recent studies that show an $800-million gap in the level of government funding between Quebec and the national average. The funding – or underfunding – theme remained central to much of the rest of the Town Hall discussion. When AUS senator Tyler Lawson grilled the Principal on alternatives to proposed tuition increases, Munroe-Blum reiterated that tuition fees are but one small piece of the underfunding puzzle. “Tuition fees have their place if they are accompanied by a commitment to student financial aid, but our first stop is federal and provincial government.